What I've so enjoyed about this e-series from Zondervan is the ability to fit a great book into my short amount of free time. I was deliriously happy to see that Becky Wade had added her name to the list of authors this year, and I've counted down the days until her Fall release. As is typical with Wade's books, there's plenty of romance and laughter woven into the story. In Love in the Details she once again balances a story of growth and faith with falling in love, and she does it immensely well especially given the short length of the book. Wade is expert at not preaching at her readers but rather allowing her characters to simply live out their faith in organic ways, struggles and all. Her characters are real, and that is a fact I've always appreciated. Oh, and she does romance very, very well. If you've read Wade's books before, you'll definitely enjoy finding her voice wrapped into this shortened version of her storytelling. While her full-length books allow more room to extend the complexity of the plot and characters (something she excels at), this was still a wonderful read in a series I hope she'll continue contributing to in the coming years. 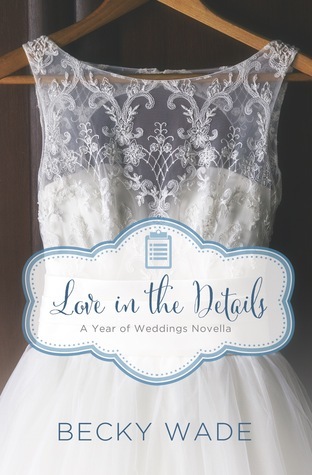 I happily give Love in the Details 5 out of 5 stars and you can purchase it here. I've got my first Becky Wade book on my bedside table waiting to be read. What a beautiful cover on Love in the Details. Thanks for sharing, Susan!